I have officially been married for twelve whole months now! That’s twelve months I’ve had to live with my husband, get to know him, learn from him and just enjoy his presence. So to celebrate those twelve months, I’ve decided to list twelve things I love about him that I discovered in the twelve months of being married to him, in no particular order. Here we go! 1. His sleepy voice. I was slightly aware that it was a thing before we were married, but I had never really encountered it in full force. I, myself, have a sleepy voice that he got to see after my first 24 hour theater experience. His is similar; getting higher and taking on a childish quality, but he gets much goofier when it comes out and it’s really, really cute. 2. His comic book knowledge. I knew going in that my husband was a huge comic book geek, but you don’t realize how far that goes until you’ve lived with a person for a while. Sometimes we’ll be talking and he can rattle off several characters and their back stories that I’ve never heard of and are probably pretty obscure. He can recount entire story lines to me in summary and enjoys talking about how well done his current favorite story line is. He knows many of the artists and writers; which ones are good and which ones are bad, and I appreciate that. Writers don’t often get the credit they deserve in visual mediums. Every time my husband goes off on a tangent about someone he’s been into for a while or someone he wants to get into or just telling me about the history of the X-Men I remember just how much I love him and his nerdy ways. 3. He gives me video games instead of flowers. This is not to say that I wouldn’t mind getting flowers. Flowers are lovely things, but let’s be honest, video games are more our thing. I never bought my own video games for PC. Mostly the online nature of Steam kind of intimidated me and before we got married I only had a debit card, which I was told not to use for online purchases. Not as secure and all that. So when my husband would ask if I had ever played this or that the answer was inevitably “No, but I’ve always wanted to.” Soon there after a little window would pop up on my computer telling me I have a gift on Steam. Sometimes it would come out of the blue, just something he thought I would like. And always it makes me smile. What more could a girl ask for? 4. That smile. He has this smile that he does whenever he feels clever or particularly proud of himself or when he’s suddenly had a brilliant idea. I don’t know if I can describe it to you. It’s kind of this wide sideways smile. He always turns his head a little and tilts it up slightly when he does the smile and I just think he’s the cutest thing ever. 5. He has fun with words. My husband enjoys putting random words together that sound fun. He has several combinations, but his big one is “sandwich pants.” I’m not sure where this came from anymore, but it was pretty early on in our marriage, possibly before. I will ask him what he thinks I should wear and he will inevitably respond with “sandwich pants.” A conversation on the subject may or may not follow in which I argue that I don’t have any and he tells me we can make some. The smile always accompanies such occasions. 6. He dances with me. Sure, this one technically came before we got married, but it still counts. 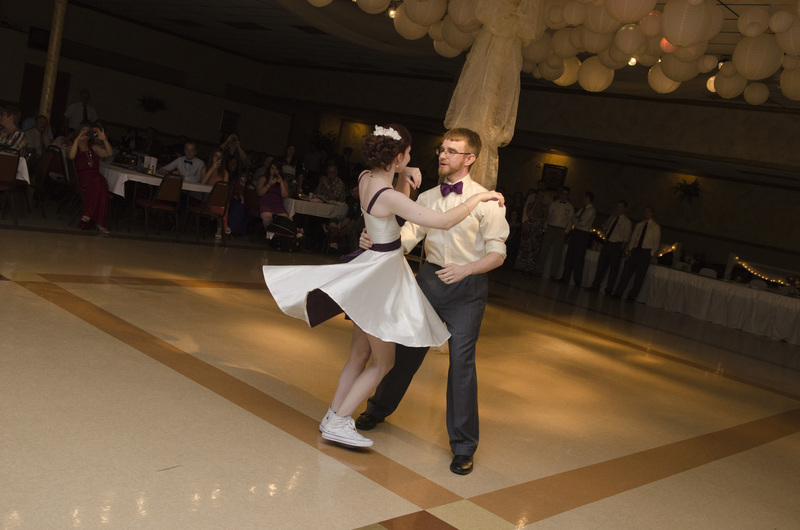 My husband didn’t really like to dance when we met, or even when we got engaged. But he will dance with me. I can get one slow dance out of him usually at a wedding and then, if there happens to be music we can swing to, I can get another one out of him. I got him into swing, as much as he can be into dancing, I suppose, while we were engaged and that was part of the only time he could see me; at swing dancing. He’s come to enjoy it, I think, though we don’t get to go nearly as often as we would like. We’ve even gotten pretty good at it. He says he can only dance with me because other girls don’t respond as fluidly as I do. I just think that’s the sweetest. 7. He makes me hot chocolate. I grew up on packets of hot chocolate, like a lot of kids did. It never occurred to me to make it from scratch, but my husband is big into making it from scratch. It’s become a regular thing in our apartment. We’ll sit down to watch a movie or show or something and he’ll ask me “Can I get you something to drink?” (which is another thing I love about him) and I’ll give him this pleading look as I debate whether or not it’s worth asking him to make hot chocolate, which he will, provided we have milk at the time. Recently we’ve been using a mix from a certain spice shop in the city, but before he would mix up cocoa powder, usually dark, with sugar and milk and it’s amazing. Dark chocolate cocoa powder comes out as a strangely purplish color in hot chocolate, but I’m okay with that. To make it even better, we put Kahlua and Irish cream in there as well. 8. He gets so excited about cooking. I love to watch my husband cook. Not only because I don’t particularly like to cook myself, but also because he really loves to cook. It’s actually really adorable the way he grins as he browns meat, adding spices here and there and wiggling a little with pleasure as he tastes it to see if it’s right. He gets super excited when he makes a favorite dish or tries something knew and it turns out well. He will often spend downtime at work going through cooking blogs and recipe sites and adding things that look good to him to his pepper plate account. He has quite the collection of things we might eventually get to someday. I just love the way his eyes light up when he thinks of something good to make. 9. He sends me pictures of cats. My husband and I are both cat people, as many of you already know. We can’t have a cat, but we can look at as many cat pictures as we want. My husband will often find cute cat pictures to send me throughout the day, just because he knows they will make me happy. Sometimes they’re meant to cheer me up, other times just to make me smile, and they always do. 10. He still takes my bag. All through college I carried this large black computer bag full of books and my computer, naturally. Thus, it was a rather heavy bag and not super fun to carry around, but I managed. Then I started dating my husband and he started taking my bag for me. I resisted, I’ll admit, but he would be sneaky and insistent and somehow end up with the bag. This is a thing he does, even to this day. He will take all the grocery bags if he can, he will take my black bag if I’m going out with my computer, he will take anything he can carry, to save me from having to carry anything at all. So basically he’s the sweetest. 11. He loves science. And math; he was a STEM major, after all. I’m not a mathy/sciencey person so I don’t get it most of the time. I think science is super cool, usually, but I don’t always understand it. Math is basically a foreign language to me. But my husband makes it make sense. To him it’s beautiful and awesome and so cool and it all works out perfectly. He gets so excited explaining theories and how complex equations work and how things work out in physics and such. It’s amazing to me. I love to see him get so passionate about anything, and especially something I don’t understand. I don’t get it, but he does and he finds it beautiful, and if he finds it beautiful, it must be so. 12. He’s mine. Is that cheating? It might be, but honestly, that’s my favorite part. He belongs with me and there is nothing that will ever change that. He is forever my husband and I love that. Here is this amazing, wonderful, godly man who is a little goofy and super smart and totally geeky and a wonderful cook and God gave him to me to have as my own. It’s been a whole year and I still can’t believe how very blessed I am to have him. He is mine and that is the most wonderful part of this past year and all the years to come.